A tasseologist uses a special cup reserved for divining. 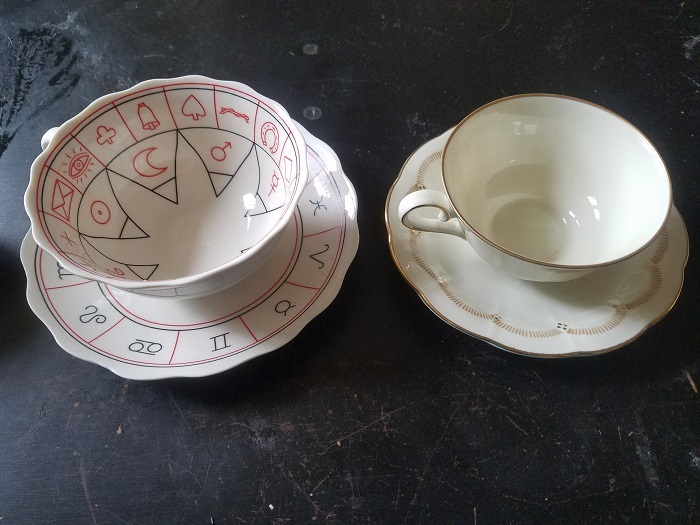 While there are some cups designed for tea leaf reading (like the one pictured left) - any cup can be used. Some good tips for choosing a cup: use something with a white interior, so you can clearly see the leaves inside. The cup should have a handle, the handle guides the reading. You'll also want to keep a saucer or an extra plate handy to prevent any mess. Reading very finely ground leaves or coffee takes skill, and will result in very abstract readings. Therefore, you'll want to use larger leaves than what you find in a teabag. 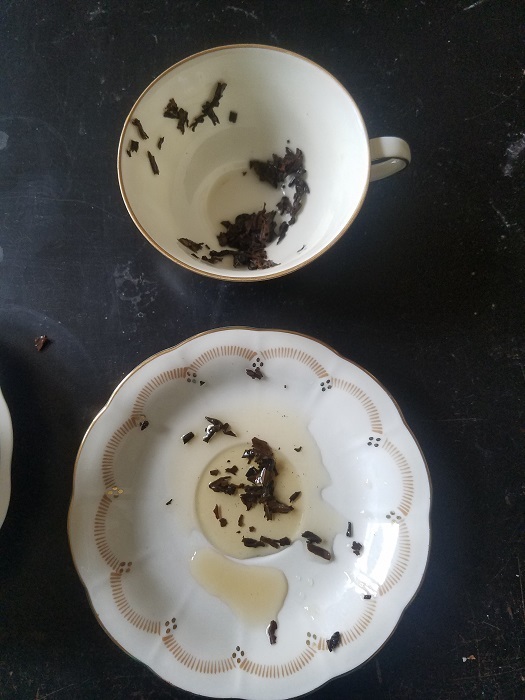 I used a black assam tea - you can see the leaves varry in shape and size, but none are longer than a centimeter. You don't want the leaves to be too big, and crowd the cup. 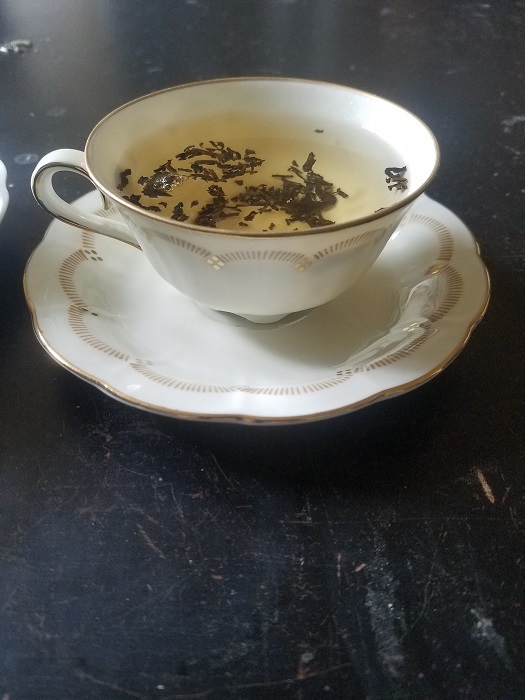 The tea I chose is also dark and easy to see in a white cup. Measure out a small amount of leaves. I used just a teaspoon, and put them directly in the cup. You don't want to use a pot or strainer, because you might not have enough leaves to read from. Pour the water and think on the question you want to ask while the leaves steep. You should also watch them as they sink and float. Floating leaves may indicate a visitor, and the number of leaves floating may indicate how many days away their visit will be. Bubbles on the surface of your cup means good fortune is coming your way. Sip the cup at your leisure. Try to clear your mind of distractions. Focus on your question. Drain the cup almost all the way, but be sure to leave enough water in the bottom to swirl the leaves with. When you're ready to begin the reading, take the cup in your left hand and swirl the leaves three times, then quickly turn the cup over onto the saucer (or plate), let it settle, and then set it upright for the reading. Don't worry if there are no leaves left in the cup, that simply means that your future is uncertain, you should give the matter some time and then try again. You can expect some of the leaves to fall out of the cup into the saucer. Some tasseologists use these leaves for a seperate reading, but usually they are discarded. As you prepare to read the leaves, the geography of the tea cup will be your guide. Hold the handle of the cup towards you (or the person you're reading for), the handle represents yourself and your currant position. The leaves closest to the handle represent matters that are closest in significance to you right now. The lip of the cup represents recent events. Check the lip for a star - because that means your wishes will come true. The middle of the cup is the more recent past, maybe days, weeks, or months back. The bottom of the cup is the distant past, and can also represent your misfortunes. Things lying to the left of the handle indicate the past, and those to the right of the handle are of the future. The farther away from the handle they lie, the farther forward or back in time they are from you in the present. Glance at the cup, squint your eyes and look for overall first impressions. Is the cup very crowded? This could indicate a very complex problem, or a very muddled mind. Are the leaves clumped in a particular place? Or scattered like stars? Do they appear to be making a larger picture? or several smaller ones? Seeing how the different leaves relate to each other puts the reading in context and provides further insight into what the symbols you find might mean in relation to your question. At this time, you'll want to look at the leaves in their groupings and write down, or speak aloud, whatever comes to mind. You're first impressions of them are most important. Turn the cup in your hand and look closely at the leaves to decide what shapes they are taking. The leaves in their groupings might look very specific to you. For example, I saw a tall woman in a ballgown and feathered hat throwing umbrellas out of a briefcase. This seems rather ridiculous at first, but when I pick apart the symbols and what they mean to me - a woman of means emptying out her business of protection may be relevent to my question - which was about my career. Because it's at the bottom of the cup, I would read that as a warning not to take my success for granted, and to be careful in my bussiness ventures moving forward. An experienced reader combines their intuition with their vast knowledge of symbology - usually in a particular place - for symbols change meaning and significance over time and space. That's why it's good when you're starting out to look up different symbols and their meanings, or to consult the people around you. Ask them, "what does this symbol remind you of?" then think of the symbol in context of your question. 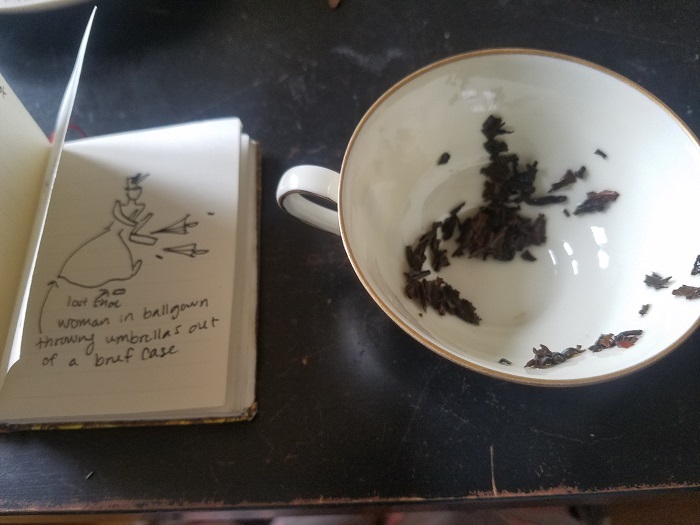 Tea leaf reading is interesting because no two readings will ever be the same. What's more, we all see and relate to the world differently, so the same symbol can have infinite meanings. That's why it's good to consult multiple books, people, and web sources to keep perspective. Being open to all the possibilities allows you to get the most out of a reading. There are now finite answers. What looks like a table to me, might look like a bridge to another person, and a doorway to the next. 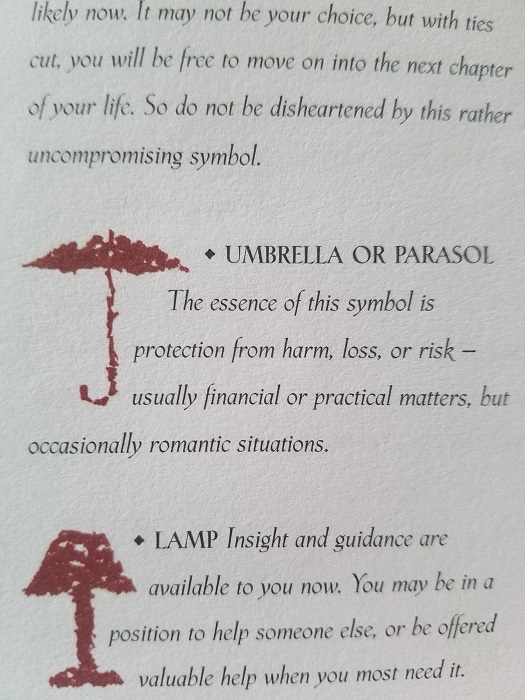 Each symbol could mean something completely different. It's up to us to make sense of it all.